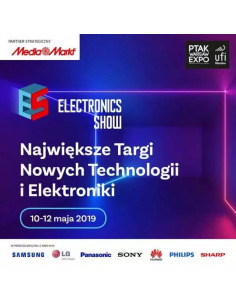 International Trade Fair of Consumer Electronics Electronics Show May 10-12, 2019 at Ptak Warsaw Expo. The International Electronics Show Electronics Show is a new generation of trade fairs that offer not only static exhibitions but also effective and dynamic presentations, enriched with industry conferences and workshops. This is the first event in Poland that presents in such a comprehensive and innovative way the latest technologies, solutions of the world's leading manufacturers of consumer electronics and related services. The Electronics Show Strategic Partner is the MediaMarkt commercial network, the European leader in the consumer electronics industry. Ptak Warsaw Expo sp. z o.o.